We once again carved pumpkins and let me just say that I am not good at carving pumpkins. Don't believe me? Case and point. Seriously, what is up with my inability to carve a pumpkin. I mean, I know I am not artistic, but seriously? The poor pumpkin. He would have been better off just staying a whole pumpkin. The torture I put him through while carving out his insides and now he looks like this! I'm a cruel cruel person. Does it put a chill in anyone else's heart? So that may be a little dramatic but at least his pumpkin is going to serve a greater purpose. His pumpkin will scare. Mine will just sit there and be horribly horribly embarrassed. 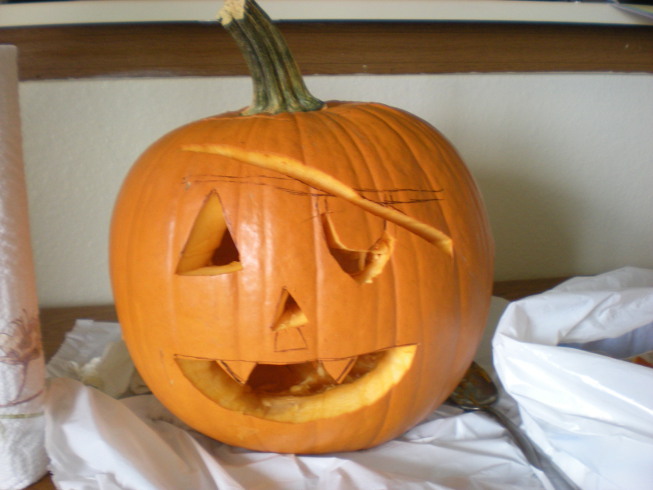 But despite my inability to carve a pumpkin - Anyone remember last years pumpkin? - I love doing it. It's a tradition. It's fun. It's Halloween! So how did everyone else pumpkin carving go? Better than mine? Or is the new thing to paint them now? I can't keep up.